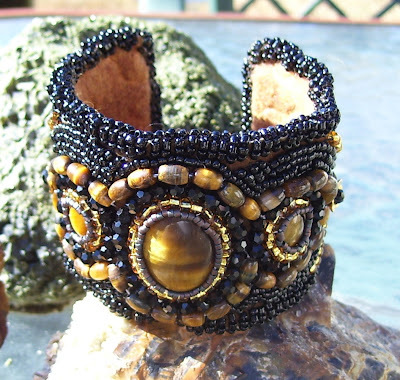 Embroidered seed bead cuff bracelet with Tiger Eye cabochons. 2” wide aluminum covered cuff. 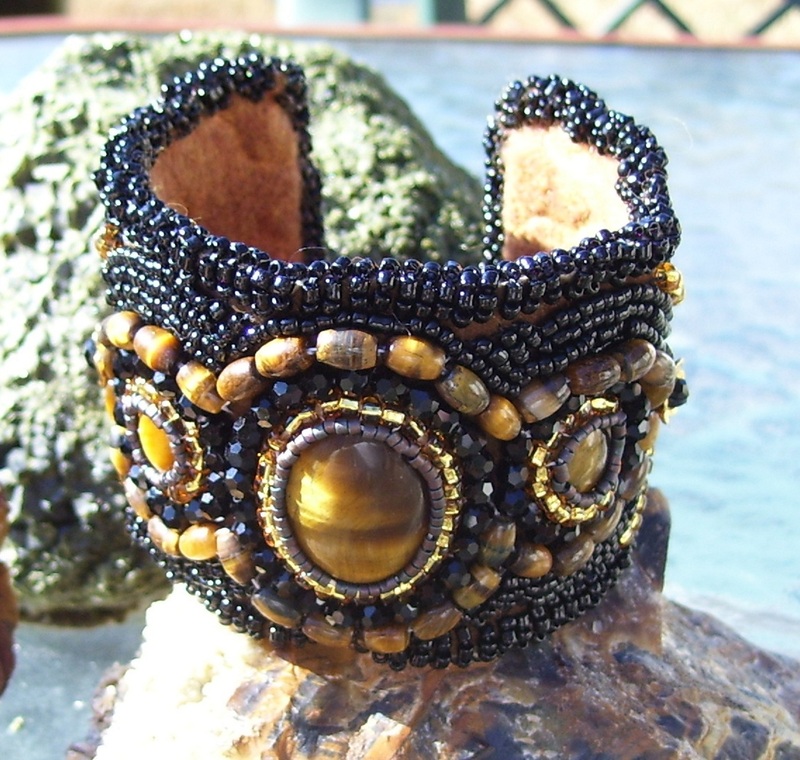 I do other types of jewelry besides the bead embroidery, but even though bead embroidery work is much more time consuming, I love doing it. I am 1/2 Canadian Indian and strive to include a native approach in many of my one of kind pieces of jewelry. I have done various forms of artwork throughout my life. While living in Canada I was very successful in making leather work, ie: moccasins, mukluks, gloves, etc. I did a lot of custom work when I lived there. Mother of Pearl oval bead embroidered dangle earrings. I have many relatives who are very talented artists as well, the closest being my mother who has her own art gallery in Kitwanga, B.C. called Gitksan Paintbrush. She is a well known artist throughout Canada with many of her paintings being purchased by quite a few art galleries. Needless to say I am very proud of her and her many accomplishments. I urge you to look at her website listed above as she has had a fascinating life. Mother of Pearl cabochon, with seed and bugle beads. 2” wide, aluminum covered cuff.